The state reported attendant increases in levels of carcinogenic “total trihalomethanes”–the combination of disinfectants chloroform, bromoform, bromodichloromethane, and dibromochloromethane–above EPA standards. Pediatrician Mona Hanna-Attisha and colleagues determined the proportion of Flint infants and children with above-average levels of lead doubled since 2014, and in some areas even tripled, with likely lifelong impact on cognition and motor skills. The state also announced a spike in Legionella bacterium in the water, with 87 reported infections, 10 fatal. Despite its geophysical etiology, back to the Great Lakes’ formation 14,000 years ago, Flint’s water is political down to its molecules. In 2011, citing Flint’s $15 million deficit, Michigan governor Rick Snyder placed the city under emergency management. The powers democratically elected officials exercised over the city’s budget, local law, and public sector union contracts were devolved to a series of unelected state appointee. In one of the nation’s poorest and blackest cities, historically victimized by environmental injustice associated with the car industry, one appointee, Darnell Earley, doubled residential water rates to twice the state average–twice that of New York City, seven times that of Miami, and ten times that of Phoenix, a city built in the middle of a desert. Michigan decided to save Flint another $20 million over eight years by switching the city off Detroit water. Instead of keeping Flint connected for the two years a new pipeline to Lake Huron was to be built, Earley, with Michigan Department of Environmental Quality approval, turned about-face on the state’s previous position and decided to source the heavily polluted Flint River. The DEQ advised the city to follow a protocol for treating the Flint River appropriate to new water systems, leaving out a crucial corrosion control chemical, standard in cities across the country, that, at the cost of $140 a day, prevents lead from leaching out of older pipes. Therefore, iron pipes in the water distribution system began corroding immediately after the initial switch from Detroit water. The iron that was released from the corroding pipes reacted with residual chlorine that is added to kill microorganisms, making it unavailable to function as a disinfectant. Because chlorine, which reacted with the iron pipes, could not act as as disinfectant, bacteria levels spiked. When coliform bacteria were detected in distribution system water samples, water utility managers were obliged by law to increase the levels of chlorine. The higher levels of chlorine, while reducing coliform counts, led to the formation of more trihalomethanes. Michigan learned of the damage early. Upon noticing its engine parts were rusting under the new water regime in 2014, the General Motors plant in Flint, which helped pollute the river, obtained a variance, costing Michigan $440,000, to switch back to Detroit water. In the face of its assurances to Flint residents throughout 2015 that their water was safe to drink, emails as early as January showed the state so concerned about its own employees’ safety that it had purified water delivered to the city’s state office building. DEQ officials meanwhile gamed resident complaints about the water by refusing to retest homes that scored high for lead and demanding owners of test homes flush their lines before water sampling, diluting readings. The stonewalling led residents to contact the Virginia Tech team that discovered, and, unlike the state, shared the extent of the crisis. Much of the blood testing since has been likewise financed by lawyers preparing to sue the state. The notion the mass poisoning could be tagged as accident, negligence, or even cover-up fails to square with a larger context. 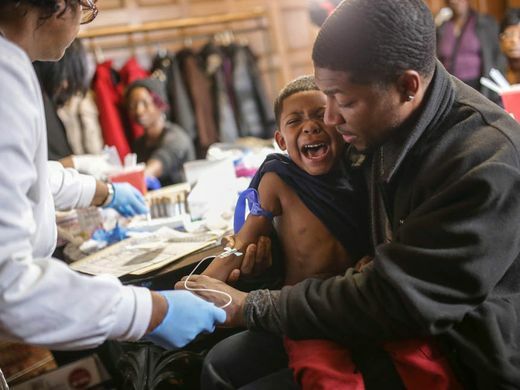 A broader program of neoliberal expropriation frames Flint’s lead crisis on three accounts. 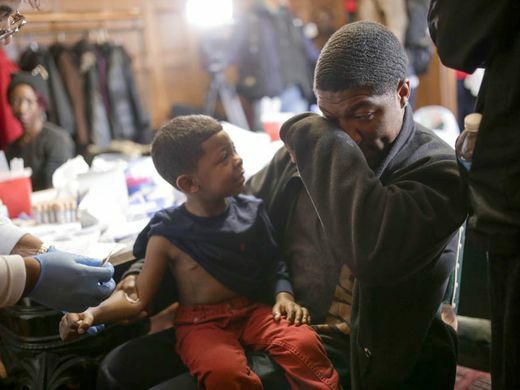 First, preceding Flint’s water switch, the Detroit Water and Sewer Department offered Flint a deal that would have saved the emergency-managed city millions. Flint could have continued on the Detroit pipeline it had used for over 50 years. The state rejected the offer because, insiders speculated, Governor Snyder was intent on breaking up DWSD and privatizing its operations. Whatever Snyder’s plans, the state, in a water war as vicious as anything in the Southwest, was clearly intent on moving Flint off the DWSD come hell or high water. Michigan helped push a “sweetheart” deal to cover Flint’s obligations for the switch. At the Karegnondi Water Authority’s request, state DEQ bureaucrats reluctantly issued an environmental administrative consent order that allowed Flint to clear its costs for the municipal bonds floating the new pipeline from its debt limit. The order ostensibly addressed water treatment sludge dumped in a lagoon area, a relatively minor expense, but at the Water Authority’s request was extended to the entire pipeline project. Michigan needed the pipeline built now that it had issued bonds to pay for it. Busch, the kind of mid-level patsy often sacrificed in state scandals, would later be charged for misconduct, conspiracy, and other crimes related to the lead crisis cover-up but, tellingly, unrelated to the administrative consent order that provided the fiscally enabled legalese for drawing water from the Flint River. Residents have since filed a federal racketeering lawsuit against Snyder, which the rejected DWSD offer and the consent order justify beyond just a clever legal stratagem. The litigants charge the state chose to institute emergency management as a means of imposing the kind of shock doctrine aimed at structurally adjusting Flint instead of applying for federal bankruptcy protections that would have allowed the city to continue to offer basic services its residents, living in an industrial country, expected. In a particularly twisted addendum, no good neoliberal lets a crisis go to waste. In March 2015, months before water filters were distributed to Flint residents, the aptronymic Dennis Muchmore, Snyder’s then chief of staff, proposed spending $250,000 buying Flint bottled water . The DEQ rejected the offer, arguing the water was fine. While Muchmore’s offer seems prescient, his motives were something other than altruistic. Muchmore suggested Michigan buy Flint the Ice Mountain brand of water, bottled by Nestle, a company for whom his wife has served as consultant and spokeswoman for years in Mecosta County, two hours northwest of Flint. Nestle is presently mining water in Mecosta. The Michigan Citizens for Water Conservation successfully sued the company to reduce its well mining there from 400 gallons a minute to 218. The pallets of bottled water that celebrities and others donated with good intent–water Flint residents are still drinking and bathing in amidst continued reports of rashes, itchiness, and hair loss–represent another manifestation of the very economic mechanics that poisoned the supply in the first place. Drawing on Karl Polanyi’s concept of fictitious commodities and David Harvey’s vision of accumulation by dispossession, Daniel Jaffee and Soren Newman represent the shift in bottled water from niche product to ubiquitous staple as emblematic of what others have presented as Lauderdale’s Paradox, in which the loss or enclosure of a freely available resource adds to its exchange value. pose substantial barriers to capital accumulation, leading one influential scholar to frame water as an “uncooperative commodity.” However, bottled water’s characteristics enable it to evade many of these constraints, rendering it a “more perfect commodity” for accumulation. Second, expansion of the market good of bottled water alters the prospects for the largely publicly provided good of tap water. We conclude that the growth of this relatively new commodity represents a more serious threat to the project of universal public drinking water provision than that posed by tap water privatization. Flint’s children, poisoned for bondholders, refute the notion the two threats need be mutually exclusive, but Jaffee and Newman’s point illuminates the extent to which capital aims at fencing off the commons. Even the water we drink. This entry was posted on May 19, 2016 at 8:36 pm and is filed under Uncategorized with tags accumulation by dispossession, bottled water, Darnell Earley, Detroit, environmental racism, fictitious commodities, Flint, General Motors, Lauderdale's paradox, lead, Legionella, Michigan, municipal bonds, Rick Snyder, Terese Olson, trihalomethane, water wars. You can follow any responses to this entry through the RSS 2.0 feed. You can leave a response, or trackback from your own site.